Haddon Hall, the operetta, has gone to orchestra rehearsals. There’s no piano part in the orchestra. My job is over, but the operetta goes on. When that happens, a large gap appears in my rehearsal and practice schedule. Something is missing. I know that piece! I want to play! After a few days, it finally dawns on me that there has been a big change. So that’s why I feel unsettled. But wait a minute. Were the past several weeks really so different? Practice as long as possible before leaving for the day. Travel 8-10 miles. Play a rehearsal. Run a sectional for part of that time. Travel again, about the same distance. Play another rehearsal, this time a piano reduction. Travel same distance, more or less. Travel some more. Which town are we in now? Teach piano lessons. Every student is on a different level. One more time! Travel again. Play for a rehearsal of combined choruses. Rehearsal is disorganized, people don’t know where to be, some of the musicians don’t know the music, conductor is very nervous. Variety during the week comes from practicing various pieces, playing piano reductions, playing parts, and practicing the organ. Don’t get me wrong; I love variety. However, even when I’m busy, sometimes I feel unsettled. Like a butterfly. Discombobulated. So I’ve been thinking about why. Other musicians I know have had similar experiences. Martin Katz left New York for the University of Michigan. I remember driving from Trenton back to New York in his rental car, arriving at the Lincoln Tunnel at 1:00 a.m., and encountering a long line of cars at the toll booth. He went into a monologue that went something like this: “Why did I rent a car so I can get to the Lincoln Tunnel at 1:00 a.m. just to wait in this line? I’ll get back too late to return the car and won’t be able to find a good parking place near my apartment. When I return the car tomorrow morning, I’ll have to pay for an extra day.” In fact, there was even more to it than that. He had to catch a plane the next morning before the car rental place opened, so I traveled 25 blocks downtown to return the car for him. He paid me for the time. One year later, he left the city. Several string players I know moved from New York to Connecticut, where they have houses and driveways. They still arrive home late following night rehearsals and concerts, but now they don’t have to look for parking spaces. They can go to sleep at least an hour earlier. Are you sensing a pattern here? Immediately after graduate school, I loved going from one end of Manhattan to the other and beyond, playing auditions, rehearsals, lessons, and concerts wherever they took me. So much variety, so much to do and see. Late opera rehearsals in Brooklyn? Fine. The singers were good! I enjoyed the conductor! Dinner was Chinese noodles at 1:00 in the morning. No problem. A few years later, I toured with the Norman Luboff Choir. Aha! The stakes were much higher! I loved the excitement, seeing the country, performing a lot of music, and meeting people in the audience. Some concerts were in high schools, others in large halls. But tours don’t last forever. I found myself back in Manhattan, playing auditions once again, running around just like I had earlier. What happened? Why was I not enjoying that? The Luboff tours were the turning point. I need to focus on long-term performances that demand focus, good technique, emotional involvement, and all the musicianship available to me. Beginning today, I’ll get a solo program together and schedule some concert dates. What happens when you look for your core? Haddon Hall rehearsals will reach a new level next week. The soloists have been asked to attend rehearsal, and will be integrated with the chorus. The piece is difficult for both soloists and chorus. The key level changes without warning, so it’s hard to hear where your line is headed. In addition, the soloists, orchestra, and chorus play off each other in intricate rhythms. Sometimes only the rhythms are difficult; at other times, the key level changes simultaneously. This afternoon, I practiced differently than in previous sessions for the same piece. In fact, I practiced many sections 2 or 3 times. In Monday’s rehearsal, I will be jumping around in the score more than ever. So first, I made sure I knew all the voice parts (solos plus chorus). After that, I practiced the piano reduction. And then I went back to be sure the singers will be able to hear which key they’re in! That means that it’s crucial to play some harmony all the time. Keep in mind that when you’re dealing with opera scores, the voice parts are often out of order, i.e. a bass part often appears above a treble part. It’s up to us to keep them all sorted out. Brackets, arrows, and extra clef signs help, as do fingerings, circled bass intervals and harmonic changes, and surprising accidentals. I frequently mark the key or time signature at the beginning of a line, page, or entrance, as rehearsals skip around in the score and start in the middle of a line or page. There may be key or meter change indicated a page and a half before a starting point. So if it’s not marked where you need it, you may not remember. Got a pencil? Marking the score can save you lots of time and even more mistakes. Please share your thoughts in the comment section below. 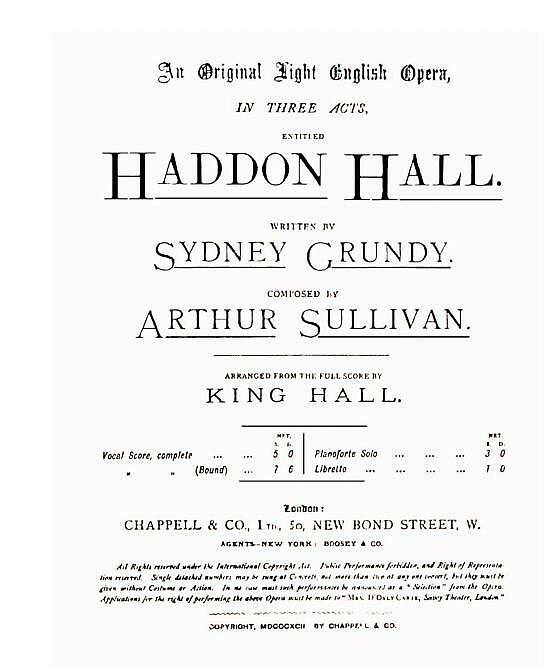 For the next few weeks, I will be accompanying rehearsals for Haddon Hall, a light opera by Sydney Grundy and Arthur Sullivan. 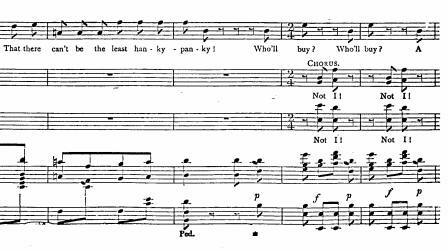 Since it has likely not been performed in the United States, no one in the group has sung the piece. I had not heard or played it. What follows is more detail about how I am learning the piece. I will discuss the playing skills needed to play effective rehearsals. After that, special attention is given to preparing for specific types of rehearsals, such as a run-through, chorus rehearsals, and soloist rehearsals. Certain types of playing are rehearsal-specific. In this case, the singers need clarity. To accomplish that, the keys will be struck more percussively much of the time. Less pedal is needed, as it obscures note duration, dynamic changes, and even range differences. Rehearsal playing often has less to do with good piano playing than you might think. Playing well to reach the goals of the rehearsal, of course, is crucial. But this is not a performance for you or anyone else. This is note-learning time, when entrances become secure, rhythms become sharp, and dynamics become second nature. Our job as rehearsal pianists is to listen to what is going on in the rehearsal and facilitate that. Listening to everyone else is far more important than assessing our own performance. An “effective rehearsal” is one in which the singers hear their cues and are able to learn their parts easily. It’s not about us. As I wrote in a prior post, I listened to the recording in order to gain a general idea of the piece. After listening, I practiced enough to play the first rehearsal. All the singers were sight-reading, for the most part. I played voice parts more often than not. The piano reduction is not needed in early rehearsals except during interludes, and can sometimes confuse the singers. I practiced the last phrase or two before each chorus entrance. That could be a solo line with some of the piano reduction, or the reduction alone. The chorus needs to hear its cues. Note: Click on each musical example to enlarge the score. Then I practiced chorus parts, circling unexpected key changes, tempo changes, unusual accidentals, and sudden pattern changes. Clarity of who sings what is more important than playing all the notes. Example of tenor solo (printed in treble clef, played one octave lower) above chorus parts. I make breaks between the solo and the chorus. That can be done without taking extra time. Connecting the lines confuse the singers, and that’s not what the performance will sound like, anyway. 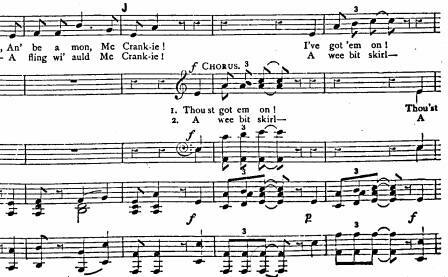 Example of chromatic writing ~ accenting chord changes helps the singers. Here I played the vocal solo part and percussive chords on downbeats. The soloists need to know what the music sounds like leading into their entrances. So we need to play chorus parts sometimes, and also the piano reduction. Make sure to note unusual or difficult rhythms. When we play them correctly in rehearsal, the singers will learn them correctly. Correcting mistakes after several rehearsals is something to be avoided. 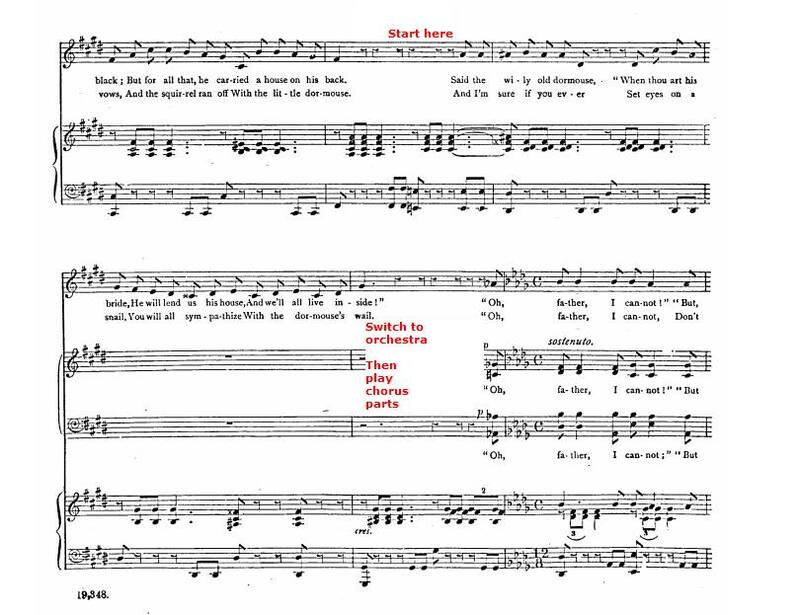 Sing every solo before the first rehearsal. When we feel where time is needed and experience where to breathe, the music makes sense right away. Second-guessing is no fun, and slows things down. In this example, all vocal parts need to be played. 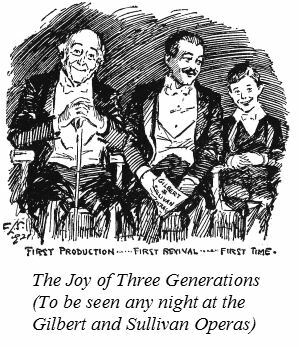 The soloist learns his entrance by hearing the chorus, so he doesn’t need to count. And the chorus hears a continuous vocal line as well. So, no matter whether this is a chorus or a soloist rehearsal. Just play everything! always anticipate what is needed. be able to jump to a different part quickly. know when to accent and when not to. distinguish between solo, chorus, and orchestra parts with our playing. play what the singers need to hear in order best to learn their parts. Do you find these notes helpful? Please share your thoughts and suggestions in the comment section below! When is it acceptable to listen to a recording before learning a piece? Most of the time, I am strongly against this as a learning method. For purposes of interpretation, copying someone else’s recording will always sound like a copy. It will never sound like you. I don’t think I’m the only person who finds this unacceptable! Last week, I listened to a recording before playing a note in order to learn a score as quickly as possible. So why is that OK this time? The score is an operetta. I will be playing rehearsals but not the performance (which is with orchestra). So this is not about my artistic integrity; it’s about learning notes, tempi, and orchestration. 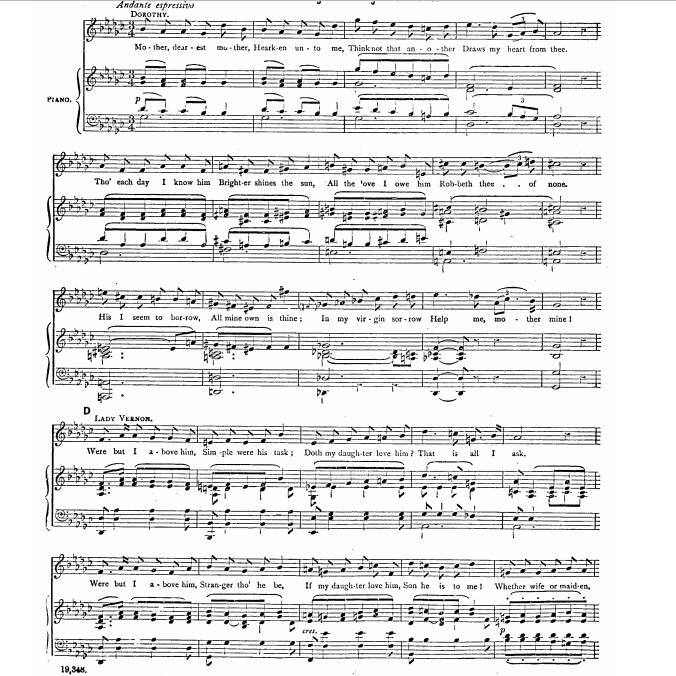 This score is not well-known (Haddon Hall by Sydney Grundy and Arthur Sullivan (not Gilbert and Sullivan)), and is printed in 19th century English style. In other words, what Americans are accustomed to seeing as a quarter rest looks like a backwards 8th-note rest instead. The notes are smaller and everything looks a lot less clear. All the lines, note heads, stems, etc. look about as substantial as if they had been written with a pencil. The repeat signs are very dim, with no double bars drawing attention to them. I had a week to learn this, having intentionally taken some time off. My plan is to play about 1/2 by what I’ve heard and 1/2 by sight. Listening to the recording will save needing to look so closely at the music for accidentals, hopefully. The first rehearsal, a run-through, is tonight! I’ll let you know how it goes. Best part so far: the second-hand contribution of Mr. Syntax. He seems merely to be quoted, rather than appearing as a character himself. Under what circumstances do you consider it acceptable to listen to a recording before learning a piece? Please share your thoughts in the comment section below! Take a look at my E-books! Just click on the icons in the left sidebar.